Amsterdam, the Netherlands’ vibrant, busy capital, is a city of colourful houses, scenic canals, leafy avenues, bicycles, trams, and a world-famous Red Light District. This is the city where Rembrandt, Vermeer and Van Gogh worked and lived, and where their works are exhibited with reverence. Amsterdam is over 700 years old, but its famous city plan—featuring large, interconnecting canals crisscrossed by smaller waterways and humpbacked bridges—didn’t take shape until the 17th century, when the river Amstel was dammed at what is now known as Dam Square in the very heart of the capital. (The city’s name is derived from the phrase “Amstel Dam”.) Some of the Amstel’s water course through the famous canals that curve around the city centre until they join the river IJ. Amsterdam has five main concentric canals curving in semicircles around the centre: the Singel, the Herengracht, the Keizersgracht, the Prinsengracht and the Singelgracht. The Singel is the oldest, innermost canal, and served as a moat around the city centuries ago. The similar-sounding Singelgracht is the largest, outermost canal, and acted as part of the city’s defense. The three other canals are collectively known as the Grachtengordel, which is now a residential district, as well as a major tourist spot and historical and cultural centre. You can easily get around Amsterdam by tram or bus, on foot, or by bicycle. The latter is an especially popular mode of travel among Amsterdam’s locals. There are an estimated 465,000 bicycles in Amsterdam, for a population of about three quarters of a million. 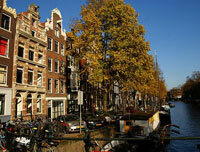 Amsterdam is the country’s centre of finance; its Stock Exchange is the oldest in the world. Many multinational and large Dutch companies have offices here, and 7 of Fortune’s Top 500 corporations have their headquarters in the financial district. Amsterdam has some of the most beautiful houses in the Netherlands, some built recently, but many dating from the 15th to the 19th centuries. This has resulted in a glorious mix of styles, from Gothic to baroque to Art Deco to modernist, that somehow work together. Perhaps the most common old buildings are the narrow, high-windowed houses that belonged to the 17th century merchants and townspeople, who built the city from the ground up. Amsterdam expanded after World War II. The new neighbourhoods, built west, north and southeast of the city core, bowed to the necessity of accommodating thousands of new residents, and feature large housing blocks and apartment buildings. But the Dutch did not compromise when it came to their beloved nature: most neighbourhoods have parks and recreation areas. Even the most urbanized areas are livened up by private gardens and public parks. Twelve percent of Amsterdam’s 220 sq. km of land is made up of green spaces. Residences tend to be privately owned; there are few places to rent because the city controls rent increases and keeps them to a minimum. Amsterdam has 15 boroughs: Bos en Lommer, Centrum, De Baarsjes, Geuzenveld-Slotermeer, Noord, Oost-Watergraafsmeer, Osdorp, Oud-West, Oud Zuid, Slotervaart, Westerpark, Westpoort, Zeeburg, ZuiderAmstel, and Zuidoost.